I seem to be on a grilling trend lately now that the weather has warmed up, and one of my favorite things to grill are chicken thighs. I grew up thinking I was a white meat only girl, and never even gave chicken thighs or legs a chance until the past few years. I now prefer thighs over breast meat, and like the price even more. Thighs grill up beautifully, and never seem to dry out. I often just marinade the thighs and then grill them without any sauce, but last week I was craving something different and began to pull things out that I thought would create a great tasting sauce such as my homemade orange marmalade, fresh ginger & garlic, a touch of soy sauce, and one red hot pepper for heat. The sauce was delicious and really made the simple thighs something special. Try and find low sugar marmalade if possible, and low sodium soy sauce is best. Although we like a bit of spice in our food, feel free to leave out the red pepper if you prefer. To keep this dish as healthy as possible, I remove the skin and trim away any excess fat from my thighs also. 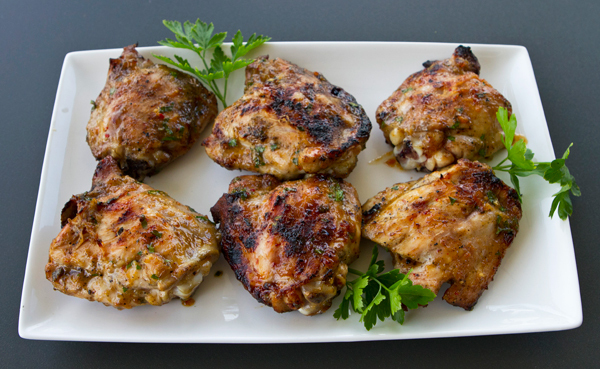 By removing the skin and trimming away any fat you are keeping the chicken thighs healthy. Choose low sugar marmalade to reduce calories. 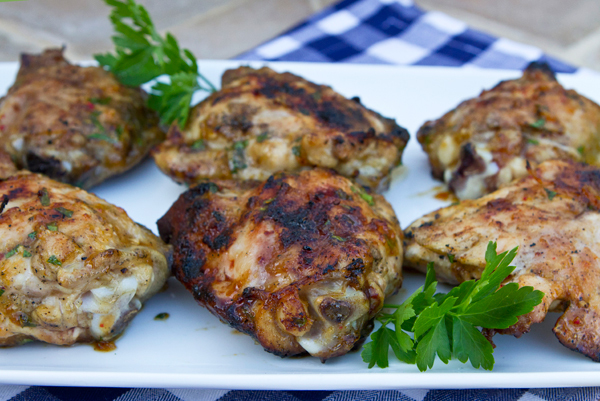 A vibrant, spicy orange sauce turns simple grilled chicken thighs into something special. Remove skin from the thighs and trim away any fat. In a small bowl mix together the marmalade, ginger, red pepper, garlic & soy sauce, then season with salt and pepper. Use a hand mixer/wand to blend the sauce until smooth. Stir in the parsley and set aside until needed. Remove from the grill to a platter and serve.